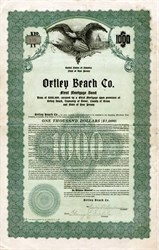 Beautiful uncancelled $1000 Bond Certificate from the Ortley Beach Company issued in 1928. This historic document was printed by Broun Green Company and has an ornate border around it with a vignette of an eagle. This item has the signatures of the Company's President, Charles Durborow and Secretary, Harry L. Nichols. South of Chadwick and Ocean Beach lies Ortley Beach, named for Mitchell Ortley, an entrepreneur who came here in 1818. Ortley planned to re-establish a channel between Barnegat Bay and the Atlantic Ocean near where Cranberry Inlet had been, profiting from tolls charged to mariners passing through the channel. Unfortunately, his workmen completed the project only to watch the tide fill the channel by the next day. Today Ortley Beach is part of Dover Township on the mainland. Ortley Beach is an unincorporated area of Toms River, New Jersey. It also known as Dover Beaches South. Like many of the ocean communities found on Barnegat Peninsula it is not that large. Ortley Beach is less than a square mile in area and is bordered by Lavallette to the north and Seaside Heights to the south. Dover Beaches South, more commonly known as Ortley Beach, is a census-designated place (CDP) and unincorporated area located within Toms River, in Ocean County, New Jersey, United States. As of the 2010 United States Census, the CDP's population was 1,209. Dover Beaches South is situated on the Barnegat Peninsula, a long, narrow barrier peninsula that separates Barnegat Bay from the Atlantic Ocean. Toms River Township is split by the United States Census Bureau into three CDPs; Toms River CDP on the mainland, comprising over 95% of the township's population, along with the Jersey Shore communities of Dover Beaches North and Dover Beaches South. Ortley Beach area (was dubbed 'Ground Zero') from Hurricane Sandy.